Mumbai, Feb 26 (IANS) A sudden change in work schedule made Shahid Kapoor a nervous wreck last month. A timely visit to his father Pankaj Kapoor spiritual guru in the hills however revealed to him the virtues of stillness in an overactive lifestyle. Having finished all his assignments, the actor has no projects on hand at the moment apart from his dad's film "Mausam". 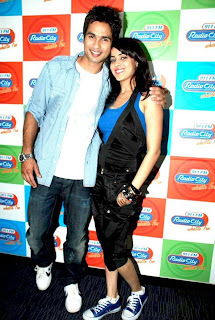 Shahid told IANS, "All I can say is faith makes all things possible. That's why it's called a leap of faith. I was working 20 hours a day till Jan 20. I was working insanely. When I woke up on Jan 21, I had no work to go to. "Initially I felt a sense of freedom. Then immediately it was followed by panic...what do I do with myself? I've become an insomniac and started tweeting at 4 a.m. I don't feel tired. I feel I haven't earned the right to rest. And I don't know what to do with myself!" However, here is the upside. "Every time I've sat at home without work, it has worked for my career. I did it before 'Vivah' and before 'Jab We Met'." 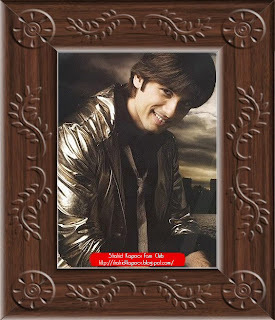 Shahid will be doing only one film in 2010 and that is his father's "Mausam". He will serve as a hands-on technician, spotboy whatever for the project. "While I'm being directed by my dad, I'd like to learn in every department. I want to learn about cinematography, choreography and direction. Most of all, I'd learn a lot about acting from my dad. I want to try and absorb from him." 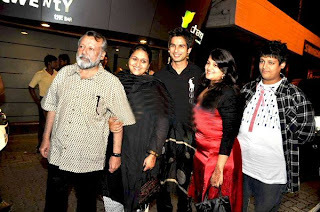 The thought of acting in front of his father petrifies Shahid. "It's a very scary thought. But in life you have to face challenges. Of course, there's anxiety and fear about acting in front of my father. I quite often think I've given a decent performance. And then when I hold a trial show for my father, all the confidence crumbles." Shahid remembers a nightmarish incident. "I remember this one time when we were shooting for 'Jab We Met' near Khandala. Dad dropped in and was watching me on the monitor. And I just couldn't give my shot! I actually had to tell my dad to leave. I tactfully told him to proceed, and I'd join him for lunch. He immediately understood. And my next shot was okay." Explaining his reason for staying away from all other projects, Shahid says, "It's a film very close to my heart because after 35 years of acting, dad is finally directing a film. After being the best actor in the country - that's what I believe him to be - he has decided to make a film with me in the lead because he wants to project me in a certain way. "It's a huge sacrifice for someone who does so little work as an actor. The least I can do is to be there unconditionally for him during the time that he makes the film." To prepare for "Mausam", Shahid needs to train as a pilot at a military academy. Says Shahid, "I don't want to reveal right now what all I'll be doing. But, yes, I do play an air force pilot. But if you think I'll learn how to fly a plane for the film, then all I can say is I haven't reached that stage of madness!" Contrary to reports, Bollywood actor Shahid Kapoor spent his 29th birthday with his family. He was especially delighted with the presence of his mother with whom he has "a great emotional connect". Referring to all the plans that had been reported for his birthday Thursday, Shahid says: "Everyone made plans that I didn't know about. It was quite annoying. Even my guest list was prepared. "But no, the truth was there were no plans beyond the family." About his mother's presence on this birthday, he says: "Me and my mom used to live together. Now we live separately. But we have a great emotional connect. So 'aal izz well' on that front. "My brother Ishaan stays with my mom and we're always hanging out together. In fact, I was at his annual day hours before my birthday. I feel I'm terrible to my family and friends because I don't give them enough time." During his 29 years, Shahid has only had a couple of birthday parties. "I had a party for my last birthday and it drove me nuts. If friends take over and have a party for me only then will I be part of it in future." His earliest memory of a birthday goes back to when he was four in Delhi. "It was in a two-bedroom apartment. As a child, I'd embarrass my mom at my birthdays by snatching the gift from the guest, opening it and expressing my pleasure or displeasure about the gift. They were very regular, typical middle-class birthdays." Regarding rumours of a link-up with actress Deepika Padukone, Shahid says: "I've met her a few times. 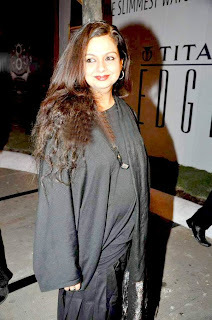 I first met her at an awards function and then we bumped into one another at a couple of parties. She seems like a nice person. "Of course, it's very embarrassing, not so much for me as for the lady. When there's someone in my life I'll announce it properly. At the moment I'm scared to even meet a girl for fear of being linked up. But I won't stop living my life the way I want to just because I fear being wrongly linked." 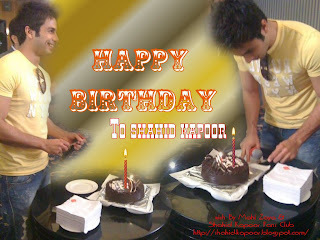 Shahid's closing thoughts on his birthday: "This is going to be a year of learning for me. In the last couple of years, I've been going on the sets and trying to behave as if I know my job." He is also excited about acting in his father Pankaj Kapoor's film "Mausam". "Now this year I'm going to be a student to my father as he makes his film. I want to go on the set with an attitude of learning. I want to come out a better human being and an actor. And I know I will because there's no better teacher than my father." DESCRIPTION: Shahid Kapoor is an effortless charmer. As he celebrated his 29th Birthday with lucky contest winners at an exclusive Meet N Greet organised by Bollywood Hungama, one came across a unique side of the hugely talented Star-Actor. So, watch Sasha wooing a young girl, answering the fan questions and also dancing to 'Dhan Te Nan'. Unbelievable Watch! 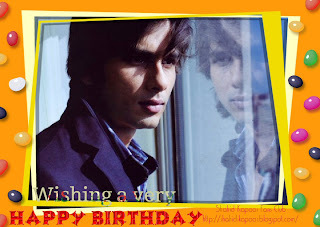 Bollywood's latest heartthrob Shahid Kapoor turns 29 today. The hunk who was most recently seen in flicks like Chance Pe Dance and Kaminey has left no stone unturned to make his mark in Bollywood. 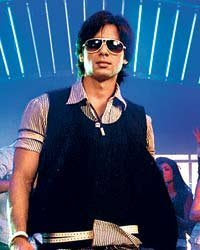 Shahid began his career by working in music videos and advertisements. He made his Bollywood debut as a dancer in Subhash Ghai's Taal (1999). Four years later, he made his debut as a lead in Ishq Vishk (2003) and won a Filmfare Best Male Debut Award for his performance. 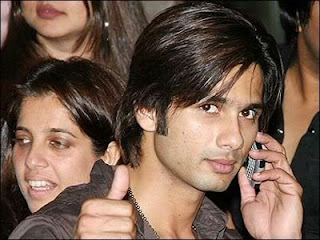 Shahid impressed the audience with his performance in films like Fida (2004) and Shikhar (2005). He tasted commercial success with Sooraj R. Barjatya's Vivah (2006), and followed it up with Jab We Met (2007) and Kaminey (2009). Bollywood's most talked about vegan has managed to grab eyeballs not just for his performance on the silver screen but also his link-ups with many B-town leading ladies. After his break up with Kareena, Shahid has managed to prove himself as the most wanted hunk in Bollywood. From Vidya Balan, Priyanka Chopra, Anushka Sharma and most recently Deepika Padukone, it seems Shahid can't have enough of our desi girls. As the dashing Kapoor turns a year older, we wish him many more box-office hits and more reasons to make women drool over him in years to come. Mumbai, Feb 16 (IAN) Shahid Kapoor is amused that his father Pankaj Kapoor directorial debut "Mausam" is being likened to Tom Cruise's "Top Gun" just because he plays an air force officer in the film. "I am relatively new to the industry but at least respect my dad's credibility as a film personality. 'Mausam', which actually is a working title, has nothing to do with 'Top Gun' except for the fact that Tom Cruise played the role of a naval flight officer while in 'Mausam' I play an air force officer," Shahid told IANS. "Other than that, there is no similarity whatsoever since my dad has written an entirely original story and screenplay of the film," he said. The young actor says his father's credibility should be kept in mind by those floating rumours that "Mausam" is a remake of "Top Gun". "My father's career spans more than 25 years and he has been known for his original work even as an actor. This is the reason why he has acted in only 35-odd movies despite getting so much critical acclaim. Do you think that for his own film as a director, he would end up remaking another film," he said. "I don't know how someone just picked the Tom Cruise angle just because I play a uniformed officer in my film. On the contrary, 'Mausam' is a love story," said Shahid. The leading lady of this 'love story' has not yet been decided, but work is on to get the entire pre-production in place for "Mausam", which will go on floors in April. "I am glad that I have full two months to prepare for the role. I have a lot of time now to give to the film and since I am not working on anything else in the interim, I have requested dad that he allow me to work on some other departments in the film as well. "I am quite interested in contributing to 'Mausam' other than just being an actor and I am sure dad would be sympathetic enough to give me an opportunity." Shahid is not signing up for any other new film. So will it be only one film at a time from now on? "That's not really the case. Also, it's not that just because it is dad's film, I am giving it any extra attention. 'Mausam' is the kind of film that an actor should be doing in a single stretch without working on anything else. "The script is such that as an actor, I have to dedicate all my time and presence to it. It's more to do with the subject and the character than anything else and you'll see it for yourself once the film releases," he said. Shahid would next be seen in Ahmed Khan's "Paathshaala", which releases in April, "Milenge Milenge" with Kareena Kapoor in the same month and Parmeet Sethi's directorial debut for Yash Raj Films in June.